Hot on the heels of Nissan's "LEAF to Home" power supply system launch last week, Toyota has announced it has developed a vehicle to home system for the mutual sharing of power between electric-powered vehicles, such as plug-in hybrid vehicles and electric vehicles, and homes. 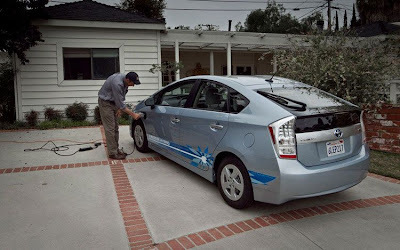 The V2H system is to start testing, using Prius PHVs, at the end of 2012 in approximately ten households as part of the Toyota City Project that began in April 2010. The newly developed V2H two-way electric power supply system can supply power from home to vehicle as well as from vehicle to home. An AC100 V inverter onboard the Prius PHV converts stored power into AC suitable for home use, while power flow is controlled according to communication between vehicle, charging stand and the home. With this new method, low-carbon electricity ("green" electricity) generated from regional or home solar generators, or low-cost late night electricity, can be stored in a vehicle's drive battery and then used to supply power to the household during peak consumption times. This kind of optimal energy flow can be automatically controlled by a home energy management system. Interest in smart grid technology and expectations for the effective use of electric vehicle batteries has increased due to recent anticipated electricity shortages in Japan, the beginning of full-scale renewable energy introduction and an increased need for emergency power supplies. Households participating in the verification tests in Toyota City will use Prius PHVs, which can use the V2H system to supply electric power to homes, as well as function as conventional gasoline-electric hybrid vehicles once onboard electricity supply depletes to a certain level. Toyota developed its V2H system while closely complying with existing charging and communications specifications defined by the International Organization for Standardization and International Electrotechnical Commission, as well as with electrical safety standards and regulations. Going forward, Toyota hopes to promote the widespread use of V2H systems while closely studying - conscious of standardization trends - system, hardware, power generation and other relevant specification standards. In addition to the V2H system, TMC has also developed devices capable of supplying electricity from PHVs directly to home devices, for use at emergency shelters in the event of a disaster. The devices will be installed on the PHVs used in this round of the Toyota City Project tests. The Toyota City Project awards eco-points to consumers who change their lifestyle habits to conserve electricity, and in 2011 there was an increasing trend toward households to use low-cost power to charge their vehicles. In light of the recent power supply shortages in Japan, the Toyota City Project is working to promote regional energy management that can respond to shifts in peak usage. In response to the increasing need to control peak electricity use, the Toyota City Project will test synchronized automatic control between HEMS and regional energy data management systems (EDMS) this year. Existing energy usage optimization technology using household storage batteries will be expanded to V2H systems, making green electricity use even more effective while promoting a shift away from electric power consumption during peak-demand times.